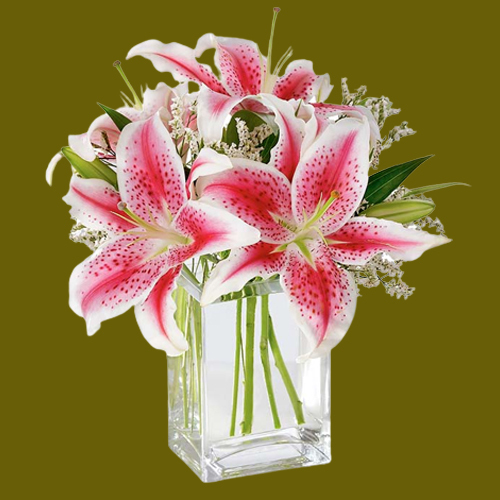 Render happy moments to your loved ones with this Pretty assemble of Four Pink Shaded Lilies in Glass Vase and frame it forever in your memory and heart. Note: As per the availability design of vase may change. Flowers Delivery Tuticorin, Send sweets Madanapalle, Wedding Cake Mohali, Diwali Mithai Devangere, Send Flowers and Gifts to Firozpur, Online Shop Palghat, Flower to Bhatinda, New Year Flowers Baroda , Fresh Fruits Jamnagar, Send Gift Durg, Dry Fruits to Nadiad, Birthday Delivery Churu, Sending to Thrissur, Flower shop Udumelpet, Solapur Online Cake Delivery.